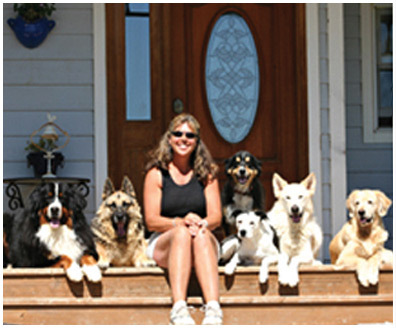 Laurie Buffington is the owner/trainer of Dog Days Training Center. She is a member of numerous professional dog-training organizations. Laurie is certified in multiple core areas of canine behavior and training including: Animal Behavior, Assessment Skills, Learning Theory. She was certified as a Dog Behavior Consultant (CDBC) through the International Association of Animal Behavior Consultants (IAABC). In addition, Laurie has passed the national board exam for Certified Professional Dog Trainers (CPDT), and is a professional member of International Association of Canine Professionals (IACP). 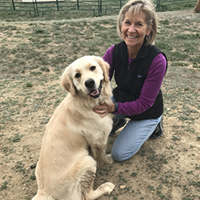 In addition to her certifications, Laurie has more than two decades of experience in dog training, and has conducted numerous assessments for at-risk dogs on behalf of the Humane Society of Boulder Valley. She has been involved with the training of service dogs for three different service dog organizations and was the state trainer for Canine Companions for Independence. 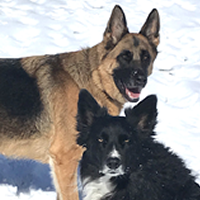 Laurie and her colleague Dr. Camille King, an applied animal behaviorist, have lectured on different occasions for the Colorado Association of Animal Control Officers. Topics included “Understanding Dog Body Language” and “Types of Canine Aggression.” In addition, Laurie and Dr. King have presented a series of educational lectures for local veterinary staff focusing on canine aggression and anxiety disorders. Laurie conducted an analysis and evaluation of a Dog Day Care system, with Camille Belpedio, for Camp Bow Wow Corporation Currently, Laurie is providing staff training regarding dog behavior, handling, and safety issues for two local veterinary clinics. Laurie has been a Sub-Investigator in a number of professional research studies. She was an integral part of a study that researched risk-behavior in puppies as well as another study that examined the usefulness of group play time in reducing kennel stress in dogs. Laurie is a Sub-Investigator, along with Temple Grandin and Thomas Smith, on Dr. King’s research study assessing the use of a pressure wrap to manage dogs with anxiety. The study is currently being conducted at Dog Days Training Center, which has been evaluated and board-approved by the FDA and ICACA to conduct professional research. Belpedio, C., Buffington, L., Clusman, S., Prete, F., Sadler, A., Whittemore, L., & Mungre, S. (2010). Effect of multi-dog play groups on cortisol levels and behavior of dogs (Canis lupus familiaris) housed in a humane society. Journal of Applied Companion Animal Behavior, 4(1), 16-27. 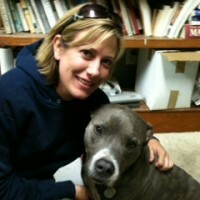 Shantel has worked at Dog Days for more than 16 years, and is an essential and integral part to all of our operations. She is my assistant, the office manager and a lover of all animals and esp dogs. In addition to her own Corgi, she has several cats, a cow and a turtle. You will usually see Shantel training the dogs and their owners in class or during private behavioral evaluations for our Board and Train program, and if you’re really lucky she might even show up at your house to help with your training! Shantel does board and train in her house for the little guys that are too small or young for the regular board and train. This board and train experience includes cats, kiddos and a lovely dog that is a great mentor. Shantel will answer your phone calls and emails, schedule your appointments and training sessions, and help with any dog questions you may have. Adam came to us in 2012. He had participated in a number of my classes with a previous dog, but at some point he decided to be owned by two Bernese Mountain Dogs. As he kept showing up with Bob and Rita to take more classes, it seemed a natural progression, from both of our perspectives, to bring him into Dog Days as an employee. He has done a great job learning to work the Board and Train dogs as a group, is a very hard worker, and has learned many complex aspects of our operations, we even let him drive the tractor! In 2017 Adam passed his CPDT-KA exam and in addition to his on-site tasks also works individually with clients on and off the property. Sally joined our staff in 2017 after taking many classes from us, and has been a great addition to the Dog Days team. 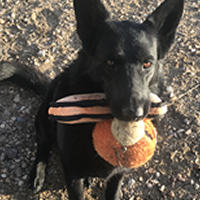 Sally helps instruct in all of our classes and privates, and loves to help people understand how to work their dogs so they can be successful in training. Holly came to Dog Days because she was so difficult to manage that a client elected to relinquish her. Sally took over Holly and has worked very hard to turn her into a lovely dog that we often use in private lessons and as a demo dog. Holly loves every person and dog she meets, and loves hanging out at Dog Days when Sally brings her to work. 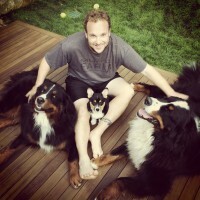 Wiley is the latest member of the Dog Days team and who arrived during the summer of 2012. 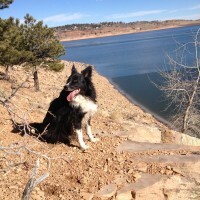 Wiley is a strong border collie who came to us because he bit someone, and had no other options. My assessment of Wiley led me to conclude that he was another high-drive, energetic working dog who needed a job in order to be successful. Fortunately, we have lots of jobs, and Wiley gets to work, run and help with all the Board and Train dogs. He has developed into a happy, well-adjusted member of our team. Tristen has FINALLY developed into a lovely member of the dog days team, although going thru his VERY LONG adolescence ( YEARS) was trying for every one here. He was a constant reminder for all of us, what it is like to have a very challenging dog, so we can all be empathetic and sympathic, and know what to do when you live with a challenging dog. . He is a very high drive dog, and getting him to learn to be calm, quiet and not constantly moving and commenting was challenging/ hence his nickname Twister. Flo has never meet a person she doesn’t like. She is sweet as can be when she is introduced to you, and a working machine. 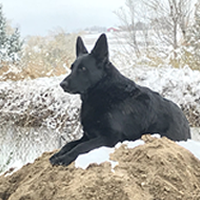 She takes her job as homeland security seriously and is constantly watching to make sure everything in her world is safe, along with her other family members; Twister and Wiley. We call them Border Control…or Homeland security. She does have a small issue hoarding her toys. Her personal best is 4 toys in her mouth and 14 tennis balls under her bed.